In the wee hours of Friday morning, the gates of the dam at Lake Blue Ridge were raised and the drawdown has officially begun. The flow as seen here is a little higher than a normal generation and is up in the trees along the bank in some places. It might be a little while before we get to fish the river. Looking on the bright side though, when the drawdown stops, any fish left should be ready to take a big fat streamer. We will keep a keen eye out for any breaks in the generation so keep checking our blog for updates. 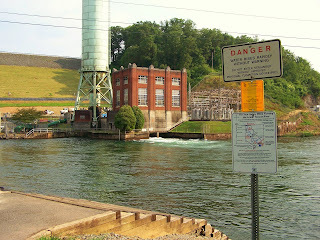 Luckily, the Blue Ridge area has a tremendous amount of trout water available to the angler. Time to dust off the short 3 weight and hit the smaller streams at the higher elevations. Noontootla, Rock, Coopers, and their tributaries hold lots of beautiful wild fish that are eager to strike a easy to see attractor pattern. The upper Toccoa has been producing some nice smallmouth and redeyes in the past couple of weeks. For more information about the BR lake drawdown, click on this TVA link.